Oh, come on. As if there was any way we could post something that didn’t somehow allude to Tuesday night’s events. I know I’m more than ready to hear some non-election news for a change, but sometimes an item is just too present in the public psyche to completely ignore. Of course, this is a country music site, and I’m not here to offer striking political commentary. 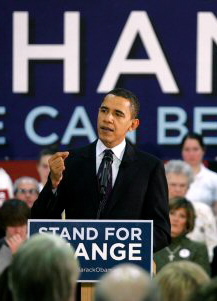 But it doesn’t take a pundit to see that the main thrust of Barack Obama’s successful campaign has been the notion of “change.” And since this idea has obviously resonated with a good faction of the American people, it seems like it’d probably be a pretty okay open thread topic, no? If you could change just one thing about country music today, what would it be? I think if I could change one thing about country music, it would be taking people from within the industry that dont have the respect and appreciation of country music and its history out of the industry. I know too many people that couldnt care one bit less about Patsy Cline, Waylon Jennings or Ernest Tubb. While I do understand and appreciate the fact that the current lack of ‘countryness’ is a genuine reflection of the far reaching influence of pop, rock, and hip hop to every corner of America, I still think there needs to be a passion for the roots. While interning at a publishing company here in town, I would ride around with my boss listening to his Ipod, or listening to it in the office…and very rarely was a country song played..be that current or classic. If the people distributing the songs to the artist dont care anything for country music, how can we expect to ever hear good country music? Fewer happy songs, more sad songs. More women on the charts. I would change nothing in todays Roots Country music. In many ways Country Music is better than ever, since many of todays Roots Country artists have so much history and tradition to draw from. As far as Pop Country, I wouldn’t want that to change either. I rather enjoy it’s continual demise. I would have more women (besides Carrie and Taylor) dominating the charts, and would take country music back to being like the 90’s era (being the best era of country music, in my opinion). I would also stray away from having crossover musicians (guess who I’m thinking of), and I would try to have the artists make great albums with great-quality songs. Music… on music TV channels… with females getting more than 1 video out of every 5. So far I have to agree – and would especially like to see more women on the charts. I would change the declining sales and make country music so popular (all forms of it) that it’d be the dominant musical genre in the USA and by doing that, it’d have even more passionate fans. Also with that, I’d keep most of the stars their down-to-earth self. Also it wouldn’t hurt for radio to play somethin’ with twang more often. I would just like for thesound to be a little more traditional, make sure that it can at least be identified as country. I would also like to see the labels have more faith in their artist, some more support for them. Also wouldn’t mind if the radio was more willing to trust the listeners with what they want to hear instead of just playing what they think we want to hear. Also, I think that CMT and GAC should get away from all the reality shows and movies that have nothing at all to do with country music and go back to playing MUSIC videos. JR – hmmm – that would make sense — did you see that CMT just annouced the cast for the third season of GONE COUNTRY….heaven help us…. More older artists on mainstream radio. Make twentysomethings (and younger) the exception rather than the rule. scratch that last “this”, see what happens when there is no preview comment button? I would change the fact that the industry, although mainly radio, virtually ignores the older artists – especially those still making great music. I agree with not ignoring the older artists still making great music. I’d make Chesney take a ‘real’ vacation from making albums and become an artist again. The Dixie Chicks also need due respect considering they were treated badly by the industry. And country music needs to jump off this hick thing, being a hick or redneck doesn’t make you country and it’s not what country is truly about. It’s lazy, uninspired writing and it only gets lazier considering we’ve had roughly 931 songs written with that theme in the past 3 years. Besides everything else that folks here have mentioned…how about just getting back to the basics of telling stories about rural life? Isn’t that what Country music is supposed to be about? And while we’re at it, to paraphrase what David Allan Coe said in 1975, how about more songs about Momma…or trains…or trucks…or prison…or gettin’ drunk? I’d like to see country music highlight local artists, often performing in the middle of nowhere. Nowhere famous is the hometown of alot of great country artists. Wonder who is out there writing heart-touching, change-your-life songs that we will never get to hear. Maybe country music would benefit from alot more local Blue Bird Cafes. Achieving fame is but one measure of greatness.